What to do when brake drums have become dangerously thin from turning too many times. I have spoke to Rob at Brake and Equipment Warehouse in Minneapolis. At this time they do not have a viable solution to this problem. What say you? There used to be a company that would flame spray powdered metal onto the friction surfaces of unobtanium drums to build the thickness back up. The fact that they are no longer around is telling. I'm afraid that there aren't a lot of options for "refurbishing" drums that are too thin. Some vendors can modify newer drums that are close. They won't look exactly correct, but they will work. I recently did this with rotors for my Delta 88. I've got 1969 disc brakes on it, and new rotors are unavailable. I've found that rotors from a mid-2000s Cadillac CTS are close enough to work with some minor machining. Anyone who is wearing out brake drums is maximizing their enjoyment over investment. This is fantastic, and I think that legitimately opens the door to non-factory safety improvements - not that anyone needs justification. Have you checked the Hollander interchange manual? How about the re-coring services - are they as durable as advertised? Next up would be the more visible disk brake conversion. Enjoy the driving and best of luck! The drums I am specifically concerned with are 1934 - 1936 Auburns. They must appear authentic . No disk brake conversions. 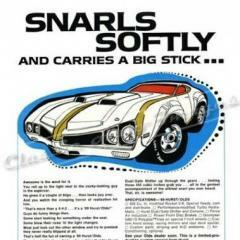 There must be other cars of the era that have this issue. Depending on the diameter and shoe width you may be able to find an alternate that would work with some machining or drilling. In the 1990's I had a '56 Olds daily driver. I had one rear drum that was stuck on and had to be beaten off. Those drums are a two piece assembly and the rears did not survive. I couldn't find a new one back in the letter/stamp days. I scouted out the size and bolt pattern to find that a 1967 Olds rear would work but had a large lip over the backing plate. We had a little machine shop that charge $50 per hour and they skinned that flange off. I ended up with better drums than the original. What are the dimensions of the brake shoes and wheel bolt pattern? There is and they have solved the problem authentically - the H.H. Franklin Club has been selling new brake drums for Franklins for many years now. From 1928 onFranklins use 14 inch Wagner Lockheed pressed steel drums. I ran into this problem with some customer's cars having dangerously worn thin drums about 15 years ago. I tried a spray weld re-metalling service, but the metal didn't stick uniformly when machined to size at temps that would not heat warp the drums. As head of the Club's repro parts department at the time, I looked into having new steel drums stamped to match the originals. There are very few companies with a press strong enough to stamp such thick steel. The estimate was over 20K just to make the stamping dies. So, without a large volume of sales, it was going to be prohibitively expensive in this country just to get the stamped blanks before the costs of machining all the rivet, lug bolt, and center holes. Having hit a wall with my limited experience at such a quest, I twisted the arm of another Club member, who was an engineer with Stanly tools, to take over the Club projects. Smartest move I made because he's done a fantastic job of it. He has far more experience at projects such as this. He contacted a foreign company, got samples drums made and delivered, Then sent those out to a metal testing lab to be tested for quality to meet specs. The results were all good. So, the Franklin Club has been selling new brake drums at a reasonable cost, with a slight profit to plow back into making more unobtainium parts. And as it turns out, the new drums are actually a few thousands thicker than the originals. PM me and I'll give you his contact email. The bolt pattern is 5 1/2 Diameter is 12". 2 inches wide. 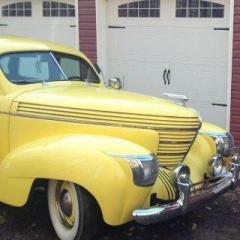 The drums are cast iron, not known to fit any other car but 34-36 Auburn 8 cylinder. When I was contacting companies to get new steel drums made, there were some that recommended switching to cast iron because it would be less costly to have a foundry make patterns and cast new drums, rather than thousands on making the special dies for getting heavy gauge steel stampings. But in the case of Franklins cast iron drums would not only be unauthentic, it would cause wheel clearance problems with the needed thickness they were telling me about. You might try contacting a foundry that does a lot of antique cast iron parts, such as Tomahawk. http://www.tomahawkfoundry.com/ They've done work for me. Accurate, good quality, and very fast turnaround. I've sent them patterns, but like most foundries I'm sure they have a pattern maker that can work from one of your drums. An email to Al with pictures and dimensions and he should be able to give you an estimate. Then have the castings shipped to your machine shop of choice to finish. 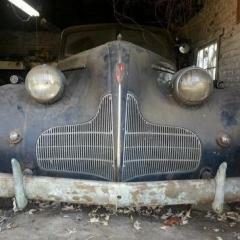 Do you know anyone with a parts 1948 Lincoln? You might get a surprise. 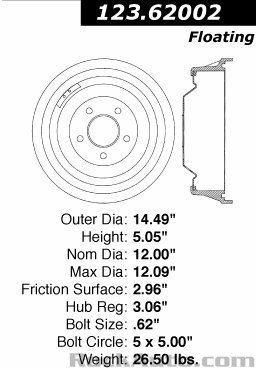 Lots of cars have 12" x 2" drum brakes. Many even have a 5 x 5.5" bolt circle. Any competent machine shop can redrill the bolt holes and change the center bore diameter. If the center bore is too large, simply make a spacer ring. This 12" Caddy drum might be able to be machined to fit, for example. Ford also used 12" drums on trucks. Speedway Motors sells these 12 x 2 drums with a 5 x 5.5" bolt circle. Apparently they fit 37-48 Fords. 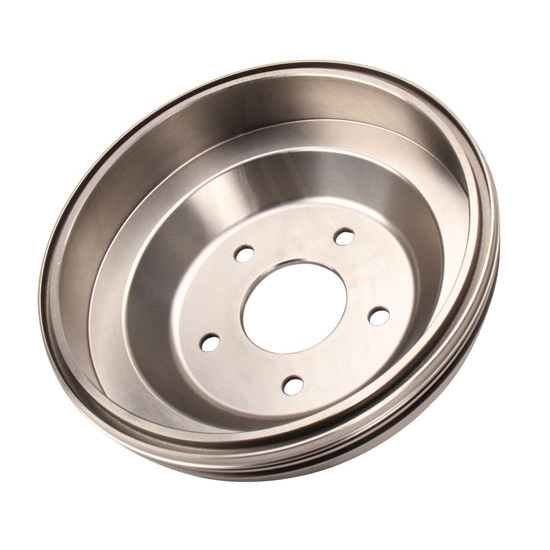 Anyone who is wearing out brake drums is maximizing their enjoyment over investment. Unfortunately, my experience is shops turned the drums too many times when they did not need ANY turning! Needless waste of metal. Back in the day "menu" pricing a brake job always had turn the drums as part of the package deal. No actual thought process on the part of the technician. If you are thinking about 8 cylinder Auburns, The Hollander says "Some Chrysler '34 CU if 12" will fit. #311 is same size except 3/64" deeper". The others in the interchange are LaSalle '34-35 & LaSalle '36-50 rear only. No interchange is given for 6 cylinder cars. Aren’t the drums riveted to the hubs on the 35 and 36? Been awhile since I have them off. I have explained the solution a number of times on this forum. 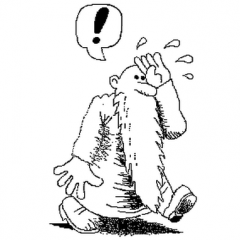 I apologise I do not have time this week o next to write in chapter and verse again. You need to clean, de-grease, and pre-machine the drum mounted to run true, as when you machine the sprayed coating. Best and most economical is a Metco wire-feed sprayed coating. It is called Metco LS, a low shrink carbon steel machineable coating, which has significant Molybdenum content, in range of 5 to 7% from memory. It is work-hardening, so I have always machined it at very slow cutting speed with a Tungsten Carbide cutting tool. ( The big old English Lang Lathe ha a minimum spindle speed of 12 rpm and that works best. ) If the tool loses its edge you regrind with a diamond wheel and start again. I pre- machine with a sharp point to give a surface like a screw thread.. I de-grease again and then grit-blast with aluminium oxide grit . I only have a Metco 10E gun that uses oxy-acetylene flame and about 40 cu ft/min compressed air to drive the feed turbine and propel the molten droplets onto the job . you seal the coating with a phenolic sealer. It is better to find someone with a double feed electric spray with the same material in 16th diameter wire. You get the same coating. The coating uis sprayed onto a thin bond coat of nickel-aluminide. The braking characteristics are very similar to SG cast iron, but you will probably never need to machine or grind the drums again. it is a quqantum improvement on steel drum surface. and drums cannot be recognised as changed from original visually. It is invisible modern technology. I reclaimed the drums for a friend's 1912 English Perry; and conttary to my advice used cast iron wear linings as original. The drums never wore, and Barry told me later that it was the only car in Veteran Car Club of Victoria with castiron brakes that worked properly!! Look up the topic on my old posts on this forum. I apologise there is a lot of useful stuff to scan through. Thanks to all who have contributed ! I have posted a link on the ACD website to this thread.